In 2010, the most recent US census year, the per capita income of Black Americans was 64% of that of White Americans – a stark reminder (if any were needed) that a little more than a half century after the original March on Washington, racial inequality remains substantial in an absolute sense, despite obvious signs of racial progress such as the appointment of the nation’s first Black president. But to understand why racial inequality seems so persistent, we need to place today’s Black/White ratio in historical perspective. How much has racial inequality changed in the long run, when, and why? Conventional wisdom treats the Higgs benchmarks and the post-World War II census data as if they were one continuous series. At around 1870 the ratio of Black to White per capita income was 0.24, according to Higgs. Between 1870 and 1900, Blacks increased their average income relative to Whites by 11% (to 0.35). 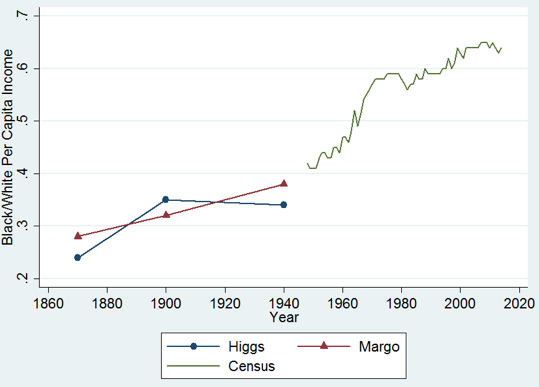 From 1900 to 1940, convergence stalled completely – the 1940 Higgs benchmark is 0.34, slightly lower than in 1900. Convergence resumed in the 1940s, accelerating in the 1960s. In the late 1970s the upward trend lost steam, and the pace of convergence after 1980 was much slower than from 1940 to 1980. Thus, over the 140 years between 1870 and 1910, the Black-White income ratio increased by 40% (0.24 to 0.64), mostly in a step-function or episodic manner in which there were two periods of relatively strong convergence (1870-1900 and 1940-1980) followed by periods of stasis (1900-40) or slower convergence (1980-present). In my presidential address (Margo 2016), I revisit the long-run evolution of Black/White income differences. In it, I revise the pre-World War II Higgs benchmarks and also sketch an economic model for interpreting the newly revised time series. I contend that Higgs over-estimated Black per capita income in 1900 relative to White, but underestimated it in 1870 and 1940. For 1900, Higgs over-adjusted for non-wage perquisites received by farm labourers and also overestimated their annual incomes. In addition, I argue that Higgs overestimated the average annual income of Black farmers. The Higgs 1900 benchmark is 0.35 – mine is 0.32. For 1870 my benchmark (0.28) is higher than Higgs (0.24) because, I estimate a somewhat higher figure for Black agricultural income and because my estimate pertains to 1870 proper, whereas the Higgs benchmark pertains to 1867-68 (and thus is c.1870). Agricultural labour markets in the South were severely disrupted in the immediate aftermath of the Civil War, and it is plausible that this temporarily depressed Black incomes. For 1940, I argue that Higgs underestimated Black non-wage and salary income. Adjusting for this, my 1940 benchmark (0.38) is higher than Higgs’ (0.34).2 As shown in Figure 1, my revisions do not alter the total amount of racial convergence occurring before World War II but significantly change the timing. My benchmarks suggest fairly steady convergence from 1870 to 1940, at a pace only slightly less than from 1980 to the present. Instead of two episodes of more rapid convergence, there is one of moderate length, from 1940 to 1980. Taking my new estimates at face value, what sort of economic model can account for the long-run evolution of Black-White income differences? By “account” I mean a theoretically coherent framework that is able to rationalise the evidently slow pace of racial convergence in the long run, coupled with the mid-20th century convergence episode. I take as self-evident that the framework must incorporate intergenerational linkages because the time period, 1870-present, spans five to six human generations. I posit a model in which adult income is a function of two causal factors, ‘racial identity’ (or ‘whiteness’, as W E DuBois called it), and human capital – their labour market prices, both positive, plus a random component. Properly measured, both factors explain a fair amount, but not all, of the variation in income in any given generation. Racial identity and human capital are transmitted persistently (are highly correlated) across generations but the random component of income is not. The intergenerational correlation in income will be less than one between any two adjacent (father-son) generations, but the correlation can decay very slowly across multiple generations (e.g. great grandparent-son) (see Margo 2016, Appendix C). Thus, if the initial gaps in racial identity and human capital are very large – as they were, just after the Civil War – and labour market prices do not change, racial differences in income will decline over time but possibly very slowly. That racial identity is highly correlated across generations is not controversial. By “racial identity” I mean complexion and other physical features but also speech, naming patterns, and related human behaviour. Historically and even up to the present, there has been very little racial intermarriage in the US. Residential and social networks were highly segregated in the past and remain so today, albeit at lower levels. In the early 20th century, some light-complexioned Blacks might have tried literally to ‘pass’ as White, but in recent generations, incentives to ‘act White’ have greatly diminished or reversed. For these and other reasons, the persistence of racial identity across generations has been substantial. In the US labour market, adult earnings depend significantly on educational attainment. Figure 2 shows the racial gap in educational attainment (years of schooling) measured at age 35, beginning with the 1905 birth cohort. 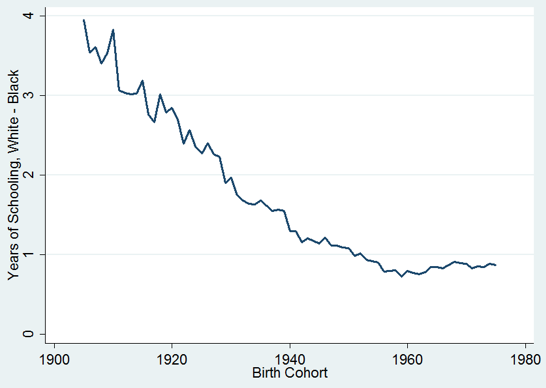 The gap declines consistently up to cohorts born around 1960, at which point the series flattens out. A major caveat with Figure 2 is that the data are not adjusted for racial differences in the quality of schooling – taking quality into account, the racial gap in schooling declined more slowly across generations than Figure 2 suggests.3 More generally, I maintain there were racial gaps in other types of human capital – cognitive and non-cognitive skills, health, and so on – that were very large just after the Civil War and which have eroded slowly across generations. Source: unpublished estimates by Goldin and Katz (2008); see Margo (2016). As my model suggests, shifts in labour market prices have also affected the pace of convergence. During the first half of the 20th century, especially in the 1940s, decreases in the returns to schooling and narrowing regional wage gaps helped narrow the racial income gap (Goldin and Margo 1992, Margo 1995). However, in recent decades rising wage inequality has slowed the pace of racial convergence, partially offsetting reductions in labour market discrimination that occurred during and after the Civil Rights era (Donohue and Heckman 1991, Bayer and Charles 2015). Short- or medium-run changes in labour market prices have a direct effect on convergence in the generations experiencing them, but also indirectly affect subsequent generations through intergenerational transmission. The model allows us to speculate about these indirect effects but, so far, their empirical relevance has received relatively little scholarly attention. Racial inequality is America’s most enduring dilemma. If we wish to understand better why it persists in today’s labour market, a long-run perspective that explicitly considers intergenerational linkages is essential. Donohue, J J, and J J Heckman (1991), “Continuous versus Episodic Change: The Impact of Civil Rights Policy on the Economic Status of Blacks”, Journal of Economic Literature 29, 1603-1643. The Census did not collect income data before World War Two, except for 1940 on wage and salary earnings. In Margo (2016) I also consider James Smith’s (1984) well-known time series of Black-White ratios for adult men (1890-1980). Although these are often referred to as ‘income’ ratios, they are instead indices of occupational status that show Black/White convergence only when Blacks move into higher-paying occupations relative to Whites. However, as I discuss, income gaps between the North and South and between more and less skilled occupations declined before World War Two, and these changes raised the Black/White income ratio, but they are only partially, if at all, reflected in Smith’s ratios. Economic historians have studied the impact of school quality differences during the ‘separate but equal’ period of de jure segregation. The consensus view is that, if the equal part of separate but equal had been enforced – it was not - racial differences in income would have been much smaller at the time (Margo 1990; Carruthers and Wanamaker 2016).